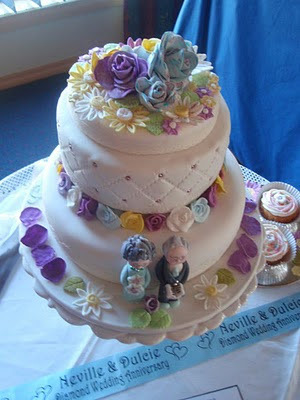 2 cakes in one day for the same couple? How did that happen? 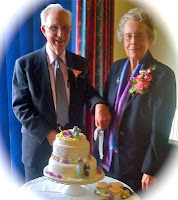 Well over four months ago Dulcie commissioned me to design a cake for her celebration of 60 years married? I began chipping away at ideas, and then Nev and Dulcie met with me to confirm their order. 2 tiers - fruit base and then caramel mud cake. 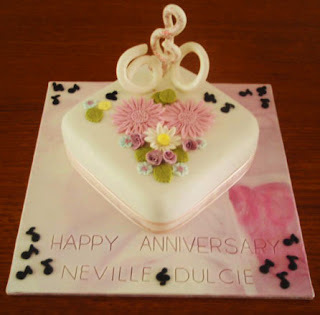 Top tier, with diamond pattern imprinted in fondant around the side. NO WORRIES I lied, when I remembered that my last experience with the diamond imprinter was a tad frustrating! ANYWAY always up for a challenge - thats me, as long as it doesn't involve bouncing upside down from a bridge over a ravine! Yes you guessed it - I like the quiet life. Two weeks in the wild and desolate Scottish highlands at the age of 18, canoeing raging torrents, rock climbing sheer rock faces and walking at high level with backpacks of extreme weight cured me of wanting an adventurous life!!! No I was not training for the SAS but rather for the risky life of a Phys Ed teacher. I loved sculpting the figures and I think they do have a certain likeness to the happy couple! The second cake was commissioned 2 days before the event by the Pastor of Albury Baptist Church. Had to include the Treble Clef as Dulcie is a strong musician. Quite pleased with how it turned out.